We are going to keep today’s article short and sweet. Well... I think we try to do that every week. Never really works that well... but we are not lying this time! 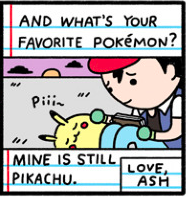 Searching the web, we discovered a couple Pokémon Comics. Who doesn’t like a good laugh, right? There surprisingly are a lot of comics out there, like anything in the internet world, but two stood out to us that we would love to share with you guys. The first comic is from “Super Effective”. We know, we know, our Podcast name is very similar to their comic title, but let’s not point in the finger here. There comics are more on the adult side when it comes to language and themes, but they are a riot. The artist has been doing them since April of 2008, and since then there has been about 40 comics, all awesome, and relate mostly to the handheld games. The second comic is on the softer side - “Letters to an Absent Father” was created by Maré Odomo. Very awesome comics. There are 12 comics so far, and you can request Maré to draw you any Pokémon on request for about $3. Not Bad! They are really cute comics, and any Pokémon fan should check them out. We don't know what it is about this comic, but it really hits home. Well done! If you don’t like comics, then this probably wasn’t the best Article. We know there are a ton more out there, but we only wanted to touch the ones we liked the best. Want to share the comics you like? Then post them below! We love your guy’s comments.